Searching for a new car in the area? Look no further than the new vehicle inventory at Thys Automotive Family! We have a wide variety of new cars, trucks, and SUVs in stock, so you’re sure to find something that fits your lifestyle and fulfills your wishes. You’ll be cruising roads in a car you love in no time! New Price! Diamond Black 2019 Jeep Compass Altitude 4WD 9-Speed Automatic 2.4L I4 4-Way Power Lumbar Adjust, ABS brakes, All-Season Floor Mats, Altitude Special Edition, Auto-Dimming Rear-View Mirror, Black 4x4 Tailgate Badge, Black Day Light Opening Moldings, Black Grille w/Black Rings, Black Roof, Bright Exhaust Tip, Cluster 7.0" Color Driver Info Display, Cold Weather Group, Compass, Electronic Stability Control, Front dual zone A/C, Gloss Black Compass Badge, Gloss Black Fog Lamp Bezels, Gloss Black Jeep Badge, Gloss Black Lower Rear Fascia Valance, Heated door mirrors, Heated Front Seats, Heated Steering Wheel, Illuminated entry, Low tire pressure warning, Piano Black Interior Accents, Popular Equipment Group, Power 8-Way Driver/Manual 6-Way Passenger Seats, Quick Order Package 27B Altitude, Remote keyless entry, Reversible Carpet/Vinyl Cargo Mat, Traction control, Wheels: 18" x 7.0" Black Aluminum, Windshield Wiper De-Icer. Thys Price includes our discount and common incentives that most customers can qualify for. In some cases, not all incentives will apply to all customers. In other cases, there may be additional incentives to improve the price. See dealer for details. Granite Pearlcoat 2019 Dodge Grand Caravan SXT FWD 6-Speed Automatic 3.6L V6 Flex Fuel 24V VVT 115V Auxiliary Power Outlet, 17" x 6.5" Aluminum Wheels, 1-Yr SiriusXM Radio Service, 2nd Row Overhead 9" VGA Video Screen, 2nd Row Overhead DVD Console, Automatic Headlamps, Black Finish I/P Bezel, Black Headlamp Bezels, Black Interior Accents, Blacktop Package, Bright Belt Moldings, Bright Side Roof Rails, Charge Only Remote USB Port, Delete Roof Rack, Front Fog Lamps, Gloss Black Grille, High Definition Multimedia Interface, Highline Door Trim Panel, Integrated Roof Rail Crossbars, Leather Wrapped Shift Knob, Leather Wrapped Steering Wheel, Power 2-Way Driver Lumbar Adjust, Power 8-Way Driver Seat, Premium Interior Accents, Quick Order Package 29P, Rear Fascia Scuff Pad, Remote Start System, Security Alarm, Security Group, Silver Accent Stitching, Single DVD Entertainment, Uconnect Hands-Free Group, Video Remote Control, Wireless Headphones. Thys Price includes our discount and common incentives that most customers can qualify for. In some cases, not all incentives will apply to all customers. In other cases, there may be additional incentives to improve the price. See dealer for details. 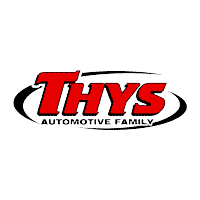 Why Shop with Thys Automotive Family? At Thys Automotive Family, we are proud to be able to offer personable small town service to our wonderful customers. Plus, our three dealership locations in Blairstown, Toledo, and Belle Plaine make it convenient for any Eastern Iowa car shopper to find a new vehicle near them. When you’ve found a vehicle you would love to take home, come see us for a test drive. If you’d like, you can even apply for financing ahead of time! Should you have any questions, we encourage you to contact us. Our on-site professionals are ready to answer all your questions and get you behind the wheel of a model that suits your budget and meets your driving needs.